The Broke and the Bookish : Jana reviews "Nightshade" (Poison Diaries #2) by Maryrose Wood + a Giveaway! Jana reviews "Nightshade" (Poison Diaries #2) by Maryrose Wood + a Giveaway! 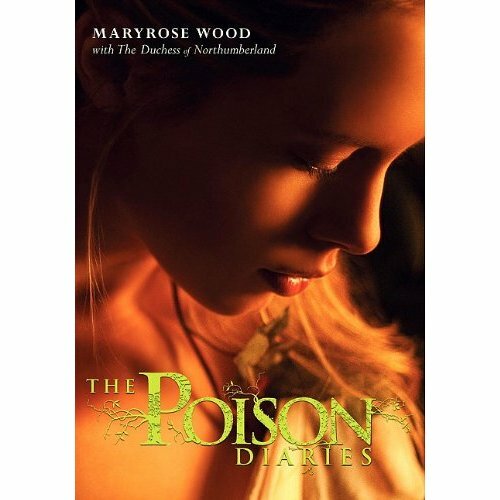 Title and Author: Nightshade (Poison Diaries #2), by Maryrose Wood and the Duchess of Northumberland. Publishing Info: Harper Collins, October 25, 2011. How I Got this Book: Harper US got together with a marketing team in the UK, who sent me books 1 and 2 so I could participate in their blog tour and help promote Nightshade around the time of its release in the USA. Why I read this Book: The storyline sounded very interesting. I love plants! If you read my review of Illusions by Aprilynne Pike, you’ll remember me saying that it’s really hard to review a book that is not #1 in a series, especially if book #1 has not been reviewed on the blog already. I just don’t want to spoil things for anyone! So what I plan to do is post the blurb from the back cover of both books. If you have not read the first one and are interested in doing so, read this review at your own risk and I will do my best to not include any spoilers! When Jessamine begins to fall in love with a mysterious boy [Weed] who claims to communicate with plants, she is drawn into the dangerous world of the poison garden in a way she never could have imagined . . .
Ok, careful! The synopsis in book 2 spoils book 1. BEWARE. Our heroine, Jessamine, has lost her faith in the men she loved, and her innocence as well. She turns to the dark side and plots to kill her father, using his own poisons, before becoming an assassin, a poisoner for hire. Can she recover from her heartache and reunite with her true love, Weed? Find out in this thrilling story where poisons, darkness and horror are a part of everyday life, and love is the only cure. That’s so cool! I love that this work of fiction is instilled with some truth. It makes it more exciting—like this whole thing could really happen (more or less, haha). I’d never thought of plants having the power to kill you. I mean, I know they can heal. I use a lot of essential oils and take a lot of herbs to stay healthy. But to think that the right combination of plants could kill you in a matter of seconds??? Ahhh! This could happen! Wanna hear something crazy? Nightshade was better than The Poison Diaries! The sequel is usually never better than the first book, but this series seems to be getting better and better as it goes on. I loved the writing style. It was so descriptive and lovely. When Weed arrived, Jessamine was pretty excited to have someone around. Here’s a quote I really liked, “He may not answer me at first, but that is no matter. I have someone to talk to, at last! My words will be like sunshine and air. My voice will rain down on him, and then we shall see what glorious orchid may blossom from this shy, unwanted Weed.” See? It’s just pretty. All the passages describing the locations, or the plants, or feelings, or emotions were just so well done. The first book did not start out incredibly fast-paced. There was hardly any dialogue for the first 50 pages or so. But I didn’t care. The author took her time setting up the feel of the series, and I really enjoyed the images she painted in my mind. Nightshade was definitely packed with more action and suspense than The Poison Diaries, and parts of it were downright creepy. Jessamine gets involved with someone she shouldn’t, and the handle he has on her… the power he enlists upon her… it’s terrifying, and kept me turning pages long into the wee hours of the morning. I could not stop until I finished. I enjoyed the characters of Weed and Jessamine. Weed was thoughtful, and made me think of nature in a completely different way. In this day and age, we’re so busy and everything is so loud, noisy, and industrial. Nature gets taken for granted and is very underappreciated. To Weed, though, plants are alive and have personalities. He has discussions with them (sometimes funny, sometimes ominous), he feels their emotions, and can always hear them singing or talking. He’s always aware of nature, to the point that it sometimes consumes his mind and he can’t think of or hear anything else. When I walk outside now, I almost find myself stop and listen for something I’ve never heard before. It’s definitely turned my walks to the car into a different experience. Jessamine has gumption. She’s a little spitfire who won’t take any crap. Do not get on her bad side, or you will be extremely sorry. Her past is a tough one, and her future doesn’t look much brighter. Weed is the light in her otherwise dark and dismal life. The bond they share is quite sweet. They both look at the world with the innocence of young children even though they’ve been through things that no child should ever have to go through. Because of this, their love is believable. They think in such simple, clear thoughts without being overly dramatic. They go on long walks, and then lie in the grass and look at the clouds. Don’t they sound like little kids enjoying their lazy summer? They are just two people who complete each other so easily and seamlessly that their whirlwind feelings don’t come as a surprise. It feels natural. Nightshade introduces us to some new characters that are not in The Poison Diaries, but I don’t want to get in to why for fear of spoiling something. All I will say is that it’s interesting to read how they both act and change around different influences and people. They are both very sheltered in Poison Diaries, but in Nightshade they are forced to branch out of their usual comfort zones. Because of their prior isolation, they are pretty impressionable, and these new experiences quickly change them. The character development from the beginning of book 1 to the end of book 2 leaves you feeling like they’ve both aged and matured so much, even though it's not even a year later. I loved reading about it. Overall, I really enjoyed both books and am so grateful to Harper Collins for sending me both of them to read in exchange for this one, honest review. I like strong characters who fight for themselves and don’t crumble under pressure. I like detailed descriptions that enrich a story rather than weigh it down under a bunch of needless purple prose. I like a plot that keeps me guessing, which Nightshade definitely did. There were so many twists and turns, and OH, what a painful cliffhanger ending! I hate cliffhangers, but love them at the same time. I love it when a book leaves me so intrigued that I still wonder months later what’s going to happen next. I know I’m not going to forget this anytime soon. It’s kind of like when you go on a date with someone you know likes you, but plays it so cool that you end up questioning things. I hope book #3 comes quickly! I was spoiled with being able to read the first two books back to back, and am not too keen on the idea of having to be patient and wait for the next one! 1. Twitter – Send an @ reply to @poisondiaries mentioning the contest, and winning a signed copy of the book. Make sure you specify that The Broke and the Bookish sent you. 2. 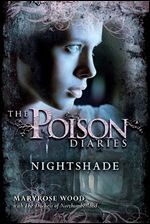 Facebook – Like the Poison Diaries Page and tell them you'd like to win a signed copy of Nightshade. Again, specify that The Broke and the Bookish sent you. 3. Website – Head over to the Poison Diaries website and find the plant “Arum Maculstum” in the Poison Garden portion of the site. Add it to your Poison Diary and Tweet your findings again (like up above - @poisondiaries) mentioning The Broke and the Bookish. Easy, right? Mentioning us doesn’t give us anything special, the company just wants to track where readers are coming from! You have one week to enter starting right now (which means the contest ends on Sunday, November 20th). Oh, and someone from TB&TB will win a copy. It might look like you’re competing with readers from a bunch of different blogs, but the company just wants to build a database of followers to contact about future books and events. Each blog will have a winner, and hopefully it will be you who wins TB&TB's copy! Anyway, happy reading, and good luck! Wow this story is so good i am going to read these series soon. Your review is great keep posting. Thanks for sharing the post.